In a word, the Chevy Impala could be best described as a survivor. Over the last six decades, it’s been here and gone in Cobb County, reintroduced by GM as of late to today’s motor marketplace with a celebrated comeback that rivals Rocky Balboa. The iconic Chevrolet showpiece was first introduced in 1957 as a 1958 model, in a decade when ‘50s family car culture was a little bit classy and a little bit rock ‘n roll. Fast forward more than 60 years later, and the 2019 Chevy Impala is being billed as this decade’s “athletic” and “sophisticated” full-sized sedan. Today’s Chevy Impala is everything we need it to be in today’s modern world. The new Impala features a roomy, rejuvenated interior, sporty performance, smart technology, and envious trunk space that’ll make the neighbors wish they weren’t driving around in a style-cramping minivan. The Chevy Impala’s popularity saw a spike in the second quarter of 2018, a trend Carl Black Kennesaw hopes to see continue throughout the 2019 year in serving our new and current Chevrolet Buick GMC customers. General Motors reports the Impala posting the highest growth of all cars in its segment, second to the top-billing Dodge Charger. The Chevy Impala was even named as a finalist for the 2018 Best Large Car for the Money in U.S. News’ Best Car rankings. 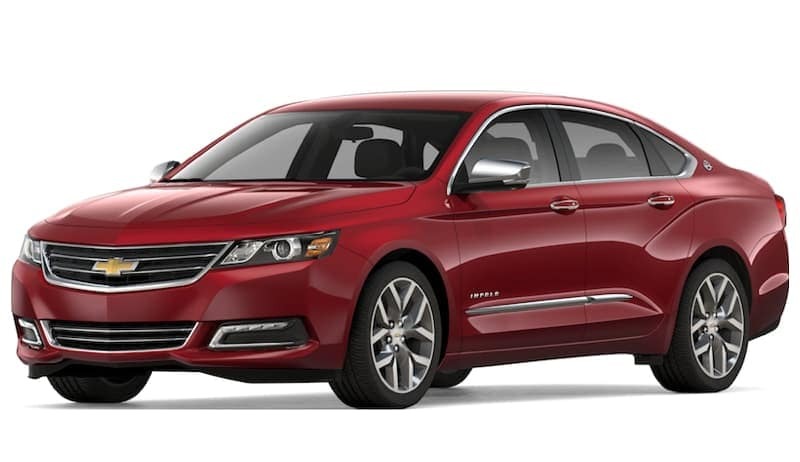 The Impala is as popular as a rental car as it is a family sedan, so Carl Black Kennesaw is honored to surpass the needs of our business class and large-fleet customers, as well as families and single customers young and old, who prefer a functional and stylish, full-size modern sedan like the 2019 Chevy Impala. Since its redesign in 2014, the Impala’s continued popularity has centered around the fact that it’s still Chevrolet’s biggest full-size sedan. Yet it’s Impala’s sleek and sculpted design that most appeals to customers seeking plenty of functionality, and interior and cargo space, while looking really good while driving it. Think “not your grandpa's bulky old Buick” — and more like a roomier, high-tech, stylish, four-door 305-horsepower sedan. In 2019, Chevy Impala will see a few changes and updates to its popular design, including interior and exterior options that should meet — and quite possibly beat — the expectations customers have come to enjoy with this GM classic. The Impala continues to be offered as a full-size four-door sedan featuring larger space between the axles. This longer wheelbase variant of the GM Epsilon II platform, called Super Epsilon, provides a fluid, comfortable ride. The advantage is a better drive, especially when hitting all those bumps in the road, including added stability when accelerating on the highway and utilizing cruise control on long road trips. Tweaks in the cosmetics of the 2019 Chevy Impala include pulling the Graphite Metallic exterior color option, while most definitely keeping nine popular hues such as Blue Velvet Metallic, Silver Ice Metallic, and Cajun Red Tintcoat. In keeping with the styles of today’s ultra-hip and ultra-sophisticated sedan design, Impala’s interior adjustments feature the expanded Jet Black Premium Cloth/Leatherette combo, available with the LT Convenience Package. Options are Jet Black, Jet Black with Dark Titanium, and Jet Black with Light Wheat interiors. Pretty sporty for a large car of Impala’s size. Interior design highlights also include premium chrome and woodgrain accents not often found on the market. Other cool Impala design updates include ventilated seats and LPO-level (accessory) wheel locks, available on all models, providing the benefit of having a visually attractive theft deterrent all your own. The Impala seats five adults comfortably, with ample room for luggage in the trunk, making it the car to have with the whole family in tow. The beauty of the 2019 Chevy Impala is not only in its sleek and smart design but also in its sporty power and torque. The Chevy’s performance diversity is found in Impala’s ample offering of LS, LT or Premier options. And by Premier, Chevy means business. The Impala Premier pulls out all the punches by generously providing a 3.6-liter V6 direct injection engine with variable valve timing, 6-speed automatic transmission, LED daytime running lamps, and electronic traction control. Impala’s LS and LT packages both feature front-wheel drive, a 6-speed sport automatic transmission, and a notable 2.5-liter ECOTEC 4-cylinder engine for 191 lb-ft of torque at 4400 rpm, producing 197 horsepower. The ECO in ECOTEC equates to the 2019 Chevy Impala’s engine shutting off when the car is idle. According to Chevy, this auto start/stop technology helps minimizes fuel usage during traffic stops by automatically turning off the engine when at a stand-still and drivers have their foot on the brake pedal. The Impala’s ECOTEC engine then automatically turns back on when the driver’s foot is released from the brake and the accelerator pedal is pushed, helping the city/highway combined mpg to average 18/28. That’s pretty impressive for a full-size sedan that offers a whopping 18.8 cubic feet of trunk space. Also standard in the Impala’s ECOTEC 2.5L engine is variable valve timing, as well as the 6-speed automatic transmission electronically controlled with overdrive for smooth and effortless automatic shifting. The Impala’s MacPherson front suspension features gas-charged struts and a stabilizer bar. The 2019 Chevy Impala also offers standard high-performance brake lining and noise and dust performance with Ferritic Nitrocarburizing (FNC) rotors to reduce corrosion and help eliminate “lot rot” by drastically improving the rotors clean factor. On a side note, GM reports that since introducing FNC on its on brake rotors, warranty claims on brakes have been reduced by 70 percent. Progress can be found in the smallest of details. The 1950’s Impala drivers would be blown away by the 2019 Chevy Impala’s state-of-the-art technology. They might actually think we’re living in the age of “The Jetsons,” based on the futuristic keyless ignition alone. The Impala’s updated dashboard features built-in 4G LTE Wi-Fi, Bluetooth accessibility, multiple USB ports, SiriusXM satellite radio, Chevy MyLink infotainment system, and user-friendly A/V touchscreen controls on the standard 8" diagonal color screen. The impressive six-speaker, 100-watt audio system comes standard, while the Impala Premium’s Bose Centerpoint surround-sound audio system features 11 speakers, concert-quality reproduction. Coupled with optional onboard navigation, these updates are just a few of the modern tech perks that help Carl Black Kennesaw customers wisely choose the Impala over other full-size sedans on the road today. The GM customer of yesteryear would also be left speechless by Impala’s updated connectivity options, including Android Auto and Apple Carplay technology. This allows the car radio or head unit to serve as a display and act as a controller for smartphones. The 2019 Chevy Impala also includes the tech-savvy myChevrolet Mobile App so drivers may virtually communicate with their vehicle from anywhere, at any time. Mind-blowing to those who grew up during the birth of rock ‘n roll. The 2019 Chevy Impala’s remote key fob remotely starts and stops the vehicle, locks and unlocks doors, and can sound the horn if needed. Remote start convenience activates the climate control system from afar so drivers can comfortably warm up or cool down the Impala’s cockpit. Chevy’s ingenious Vehicle Locate technology allows drivers to remotely find their vehicles on a map, specify boundary alerts, and set and share custom notifications for arrivals and departures. All these cool new technological advances make owning a 2019 Chevy Impala a smart choice for drivers, and their passengers, who want to stay connected while navigating today’s modern, fast-paced world. There’s a good reason the Chevy Impala can boast a perfect 5-Star Overall Vehicle Safety Score from the National Highway Traffic Safety Administration (NHTSA). From 10 standard airbags and the OnStar guidance safety package to blind spot monitors and automatic forward collision warnings, Impala’s safety features abound. The Impala’s standard dashboard rearview camera keeps drivers alert and aware of obstructions while astute parking sensors help avoid costly fender bender collisions and frustrating door dings. The Passenger Sensing System automatically switches the front passenger seat frontal airbag (and knee airbag, when equipped), on or off. Power door and window locks and rear child security also come standard in the 2019 Chevy Impala, as well as halogen headlamps that automatically turn on to illuminate the driver’s path when needed, and switch off when not. Also standard in the 2019 Chevy Impala is Chevy’s StabiliTrak electronic stability control system with traction information. This safety feature helps enhance control, especially during emergency maneuvers, by adjusting the brakes and engine torque to help drivers stay on their intended path. The Impala’s 4-wheel antilock disc brakes help reduce wheel lockup and maintain steering control during hard braking on most slippery surfaces. The new Impala is definitely not your grandfather’s old Buick. Take a test drive today. Visit Us at Carl Black Kennesaw! Whether you're in the market for a luxurious new Impala or something else, at Carl Black Kennesaw we'll have what you're looking for. Our competitive prices and flexible inventory is surely appreciated, but customers will also find themselves relying on our service and finance departments. Plus, add in the flexible hours, and you’re eyeing one of the easiest car-buying experiences out there.